Dazzle with these vintage inspired earrings and ooze luxury and style. Crafted from gleaming 9ct white gold, these drop earrings feature teardrop shaped filigree detail studs encrusted with glittering diamonds and a single rich red created ruby leading to an elegant and classic certificated pearl for a sophisticated look. 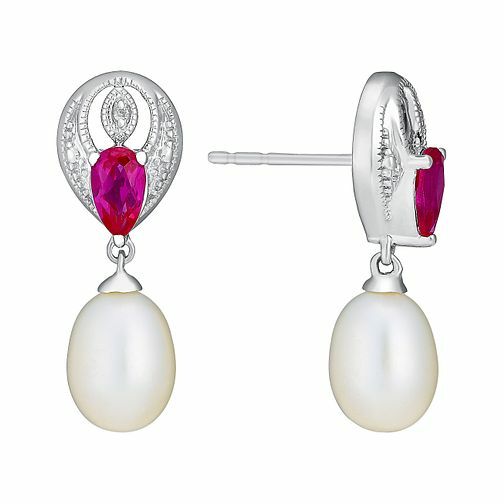 9ct White Gold Diamond, Created Ruby & Pearl Drop Earrings is rated 3.5 out of 5 by 2. Rated 5 out of 5 by Anonymous from Elegant piece of jewellery Nice piece of jewellery. It is a good size and the ruby goes well with the pearl.